There is nobody who loves a creamy pasta dish as much as me, but since cream is a no-no health-wise and also not the easiest on the waistline, I wanted to create a healthy version of a creamy carbonara pasta. 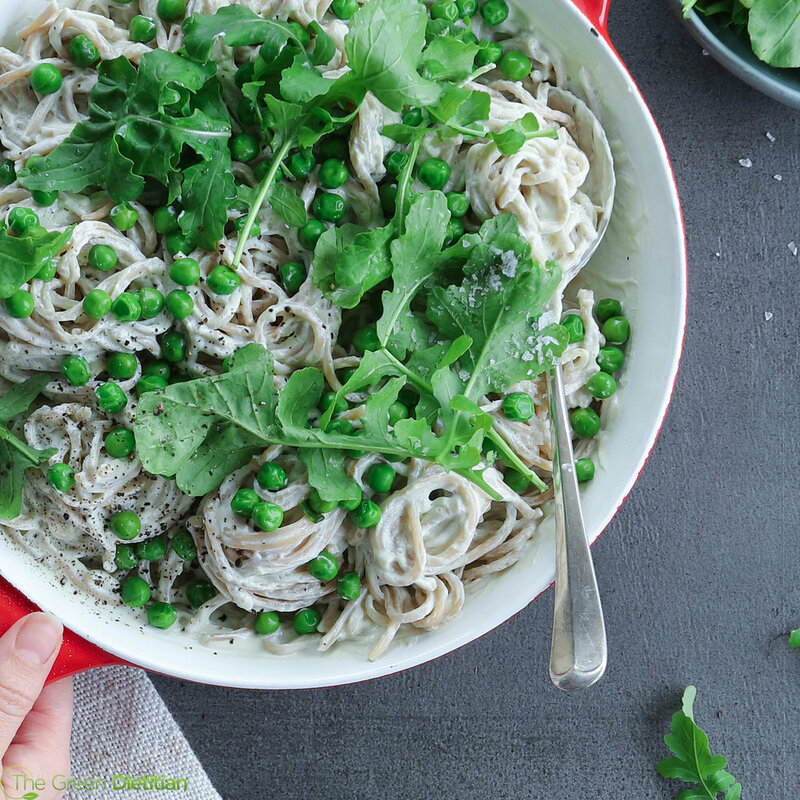 Sure, there are many healthy plant-based versions of creamy pasta sauces which make us of cashew nuts or coconut milk but I really wanted something that was lower in fat and that would make a complete meal by adding a good dosage of protein. Enter the mighty tofu. Did you know that tofu can be blended to make an uber creamy, high protein pasta sauce? Yip, just plop a block of tofu into your blender and blend until smooth. Best of all, nobody will ever know that they're eating tofu! And it's low in fat, high in protein and full of minerals! The perfect balanced meal that will actually lower your cholesterol and improve your health instead of worsen it. 1. Fill a large pot with boiling water and add your pasta. Boil the pasta for about 8 minutes and then add your frozen peas directly into the boiling pasta. Boil the peas and the pasta for another 3-5 minutes or until the pasta is al dente. Drain and set aside to cool. 2. In the meanwhile, add all of your sauce ingredients into a high powered blender or nutribullet and blend until smooth. Taste and adjust seasoning. Mix the sauce directly into your hot pasta in order to heat it through. Do not re-heat the sauce (see notes below). 3. Serve topped with fresh rocket and some grated vegan cheese. *For a lower carb option use zoodles or spinach/ cauliflower noodles. *This sauce is not suitable for re-heating as the tofu begins to cook once exposed to heat and becomes congealed so the sauce will no longer be smooth and creamy. If you want to make this for a few days in advance: keep the sauce separate to the pasta and re-heat the pasta only. The sauce will heat up if you mix it through with the hot pasta.